Find Memory Care is an industry leader in creating dementia-friendly environments. Through research and innovation, we design, develop and manufacture memory care products. These products help to transform environments for a better quality of life. This entry was posted in Find News on March 6, 2019 by Find Memory Care - Dementia. This entry was posted in Care Homes on March 4, 2019 by Find Memory Care - Dementia. 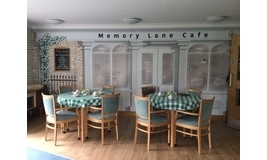 With increasing awareness of the benefits gained by having a dementia-friendly environment, more and more care providers are looking at ways they can improve the look and feel of their care facility. This entry was posted in Find News on February 25, 2019 by Find Memory Care - Dementia. For a person living with dementia keeping active in the things they enjoy is extremely important for emotional and physical wellbeing. This entry was posted in Find News on February 8, 2019 by Find Memory Care - Dementia. Always looking for ways to help improve the lives of the residents. The team at the Old Vicarage have been working alongside Find to brighten up hallways, introduce dementia-friendly signage and create interesting focal points throughout the home. This entry was posted in Find News on February 6, 2019 by Find Memory Care - Dementia.